There are more than a thousand pitch decks floating around on the internet to use for inspiration. However, if you zoom in on pitch decks from Unicorns – start-ups with a valuation of over $1bn – and it becomes clear they have an awful lot in common with each other. Roughly 10 to 25 pages long and following the same sequence of ideas. This is more than coincidence. The big VC houses are explicit about the information they want. Of course, they are; they see hundreds of pitches a year and have a vested interest in them being as good as possible. They set out the formula for a premium-grade pitch. Unicorns win investment because they follow this advice. And above all, they prioritise one quality above all: simplicity. Graham advises entrepreneurs to reduce their pitch to 10 minutes when rehearsing. This strips out the extraneous material. And simplifying this even further, Peter Diamandis, the co-founder of X-Prize foundation, believes it’s imperative that “you have an easy-to-communicate one-line pitch”. You will also need to think carefully about the length of your deck. To find out how many slides your deck should be (for instance, Uber uses 25 slides), download How to grow a Unicorn. Vinod Khosla of Khosla Ventures puts a slide on a screen, flashes it to the audience for five-seconds, and then asks the viewers to describe it. Obscure or complex slides fail the test. Everything else is secondary. This includes commercial issues such as the business plan. Surprising? In fact, the major VCs agree, the business plan is one of the least important factors. 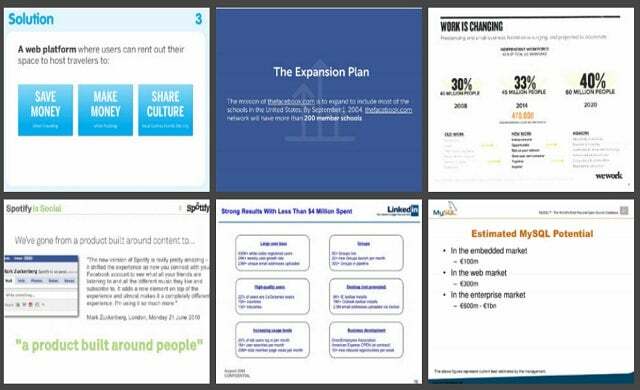 For a showcase of the best slides from the very best pitch decks – including those from Airbnb, WeWork, LinkedIn, and Spotify – download your free copy of How to grow a Unicorn. Finish with a flourish. Use emotion to capture your audience’s imagination.